You think this sounds odd? Think again! 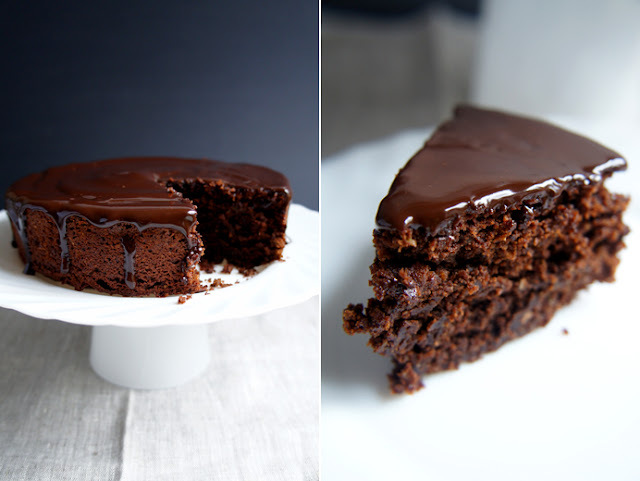 Coffee and chocolate just make a great team and the glaze on this cake is just delicious. The avocado simply serves as a substitute for butter, which makes this cake a much healthier choice than most other chocolate cakes. And it keeps the cake moist and creamy. You won’t taste it, promise! You will need a 6 or 7 inch / 16 cm cake pan. CAKE: Mix together the flour, hazelnuts, cocoa powder, baking powder and salt in a bowl. Heat up the milk in a sauce pan on medium heat and add the chopped dark chocolate, the sugar and the butter (or vegetable oil). When the chocolate is melted, pour the mixture into the bowl with the dry ingredients and mix well. Add the mashed avocado and the lemon juice. Fill the batter in the greased cake form and bake on 180°C/350°F for about 25-30 minutes. When the cake is done, take it out of the form and let it cool down. Flip it over on a plate to get the sharp edges of the cake bottom up. GLAZE: heat the butter and the milk on medium heat and add the chopped dark chocolate and the instant coffee. Once the chocolate is melted and the glaze is shiny and creamy, it's ready to go on the cake. Start in the middle of the cake and carefully push the glaze to the edges until it slightly runs down on the sides. Avocado is one of my favorite secret baking ingredients! It works so well with chocolate because you still get that buttery avocado-ness but the chocolate flavor still takes center stage. I made chocolate chip cookies using avocado on my site once, they were so good! Looks so luscious…Cab hardly wait to start baking. Yummy! This looks great! I’d love to make it, but wonder where’s the coffee? What a delicious and decadent looking cake! Your photos are to die for! I love your photos and this post! No copatminls on this end, simply a good piece. So I’ve made this twice now…everyone loves it and has no idea there’s avocado in it!